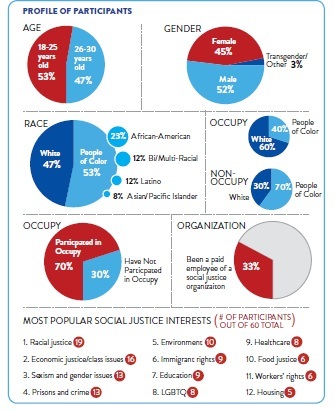 New Report on Millennials- Race and Activism – Direct Action Welfare Group Inc. 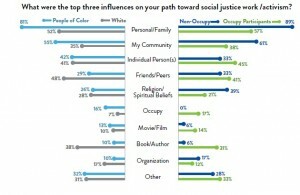 Personal and/or family experience was consistently the most cited influence in young people’s trajectory toward social justice work, and this effect is particularly pronounced among progressive people of color. Occupy participants tend to be particularly disillusioned with the electoral system and mainstream politics, and are skeptical of approaches that will siphon off the energy of their movement into electoral politics. They feel that actions outside of the system offer more potential for moving a new political agenda. When asked directly about their feelings around using an explicit racial lens, the vast majority of participants argued that it was key to the success of social movements. They identified the connections between various systems (racism, sexism, capitalism) as critical, but such a multilayered analysis is not always expressed during broad discussions of barriers to progressive solutions. Some of the findings I found interesting were the questions involving critical issues, barriers to change, and the ideal society. 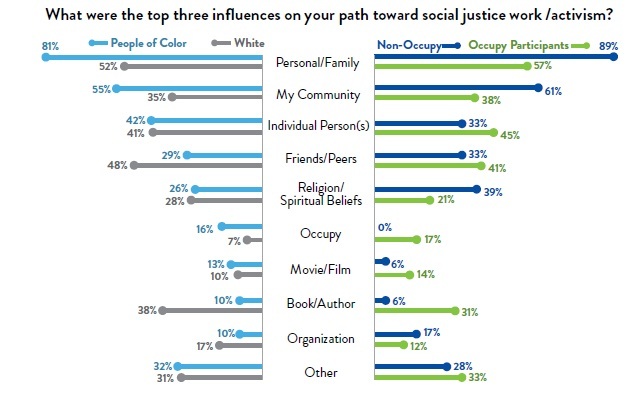 The top five critical issues as named by participants in the study were racial justice, economic/class justice, sexism and gender issues, prisons and crime, and the environment. Barriers to change cited were the general public’s lack of awareness of history and political analysis, capitalism, racism, xenophobia, consumerism, and complacency. The ideal society would be based on community and cooperation, self-government, compassion, empathy, acceptance, and understanding and that everyone would have basic food and shelter. There’s no way to say, “A + B = C”… It’s, like, super-nasty complicated. And that’s why we keep coming back to this “Is it race, is it class? What is it?” It’s both. I found this report to be very informative however, since our justice work is done in a rural setting, I wonder how different the answers would have been had rural Millenials been in the conversation. Previous: Previous post: The Millennial Generation Sees the Inequality in our Government.